You don’t need much to create this interesting eclectic design. 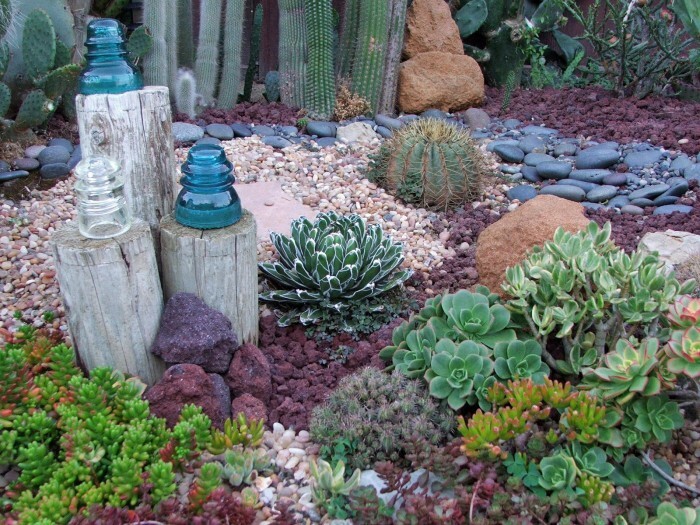 Just choose the small-sized succulent plant of your liking, have on hand several rectangular or whatever shaped plastic containers of similar size and fill with colored gravel, or sand, of whatever color you choose. 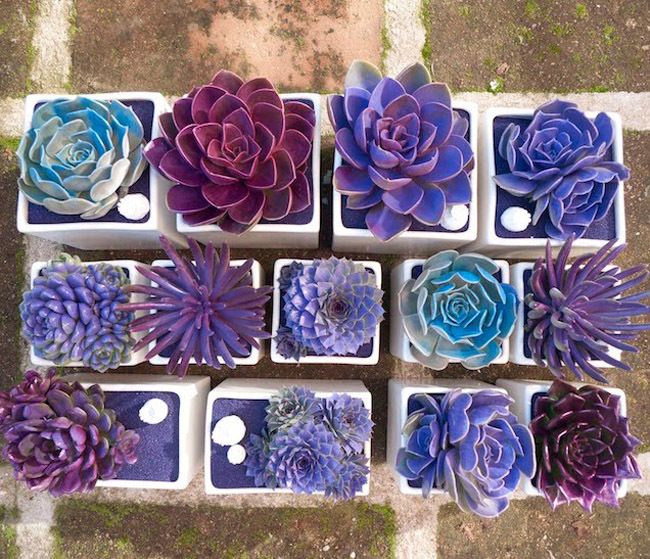 Your plants can set a single color scheme or they can be arranged in a multi-color scheme. If you add a pearl or tiny seashell to each container, then you’ll be adding a bit of charm as well. 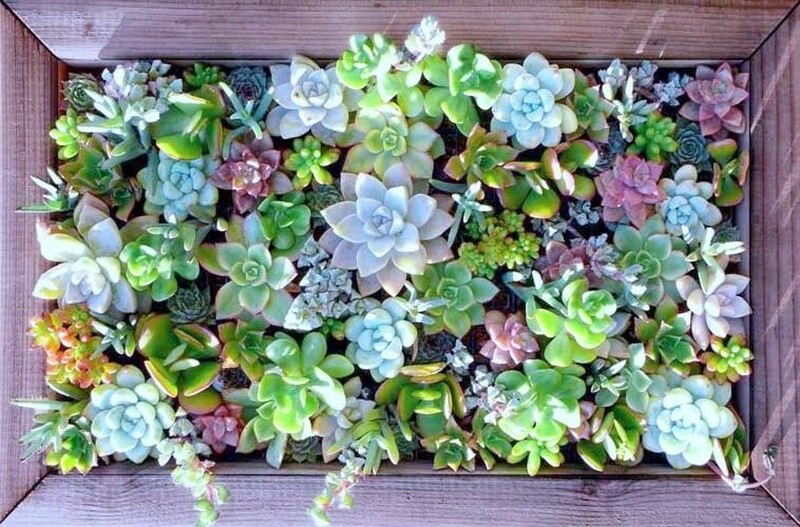 Now, simply arrange your display on a garden bed of whatever kind, or a wooden pallet, and you’ve made a charming succulent garden arrangement. Usually a backyard area is full of priceless items that you can use to bring restoration to your lifestyle arrangement. 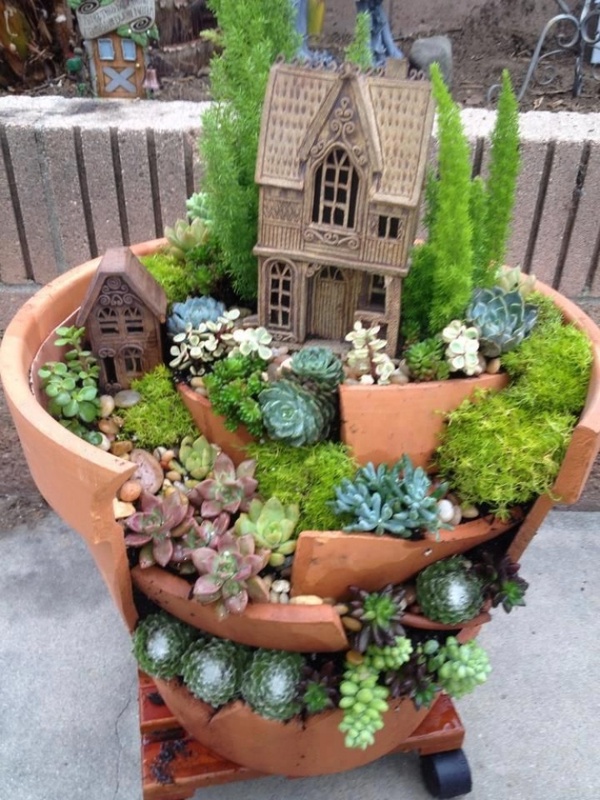 Broken pottery pieces or a broken terracotta planter especially provide a backdrop to creating some exciting designs when planting succulents. Giving an enchanting illusion of being a miniature fairy garden of sorts, this is a design that is sure to make a unique impression on those who see it. 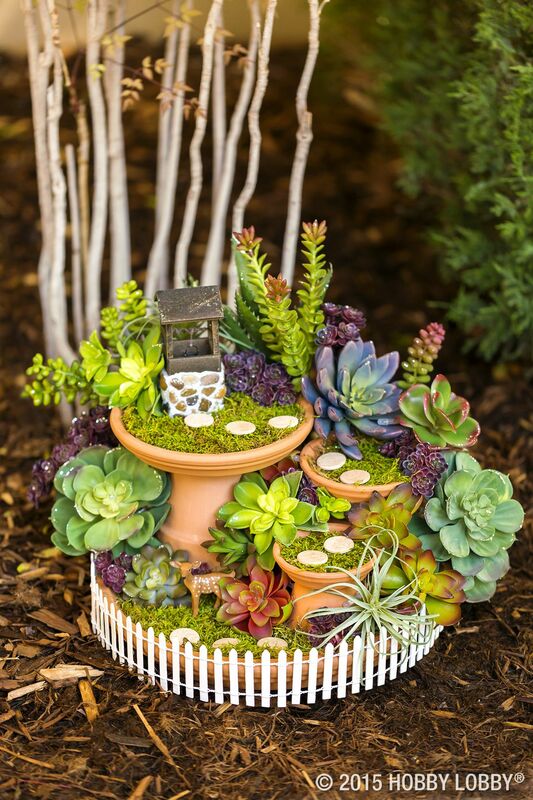 Combined with other variations of greenery, and a miniature house or castle, your succulent collection adds the crowning touch to this exterior-friendly garden design. If you live in a particular region that’s prone to dryness, or even frequent drought conditions, then you might benefit both visually and practically from this self-contained reservoir garden delight. Although it’s not a water guzzler, you’ll still have to give this arrangement a drink every so often. However, overall, it can be considered a “camel” and a must under dry conditions. A quick visit to an online miniature furniture or hobby store will uncover a fascinating collection of treasures you can use in this unique garden display. A tiny wishing well, three miniature fountain dishes on their respective pedestal stands, an almost hidden tiny Bambi and a traditional white picket fence add all the charm in the world to this wonderful collection in a backwoods setting. Now be sure to insert your choice of succulent flowers to make your day in this forest setting complete. Yes, it can also be a lizard, but chameleon sounds much more classier. 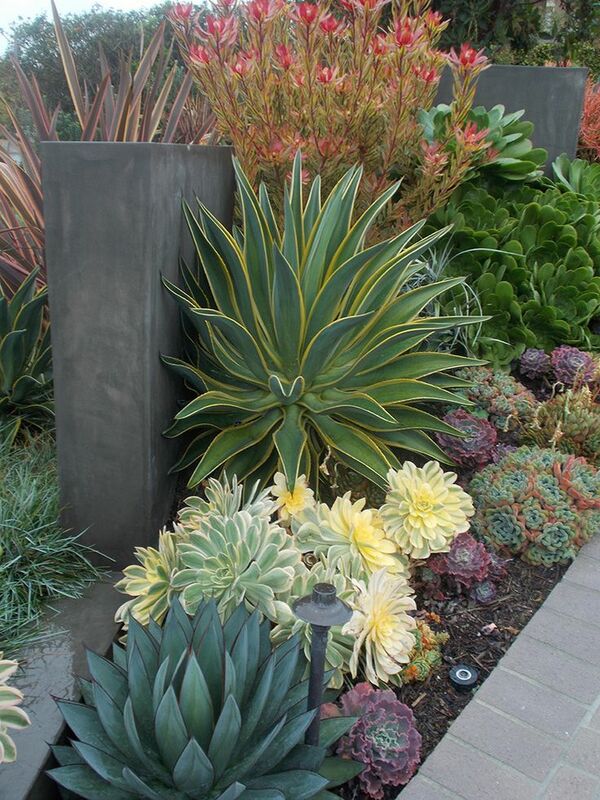 Then again, it can be whatever you want your new succulent garden to have as a lead design pattern. 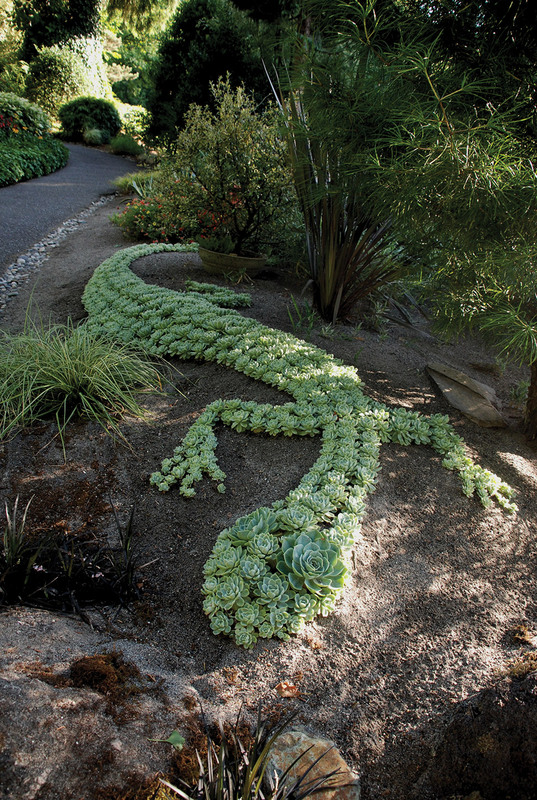 Fill your pattern design with hundreds of Echeveria “Imbricata” embedded in a mounded berm for optimum drainage, and you’ll have something to proudly display and cherish. Easy to maintain, this giant lizard sculpture is the perfect conversation piece for all of your bridge game afternoons. 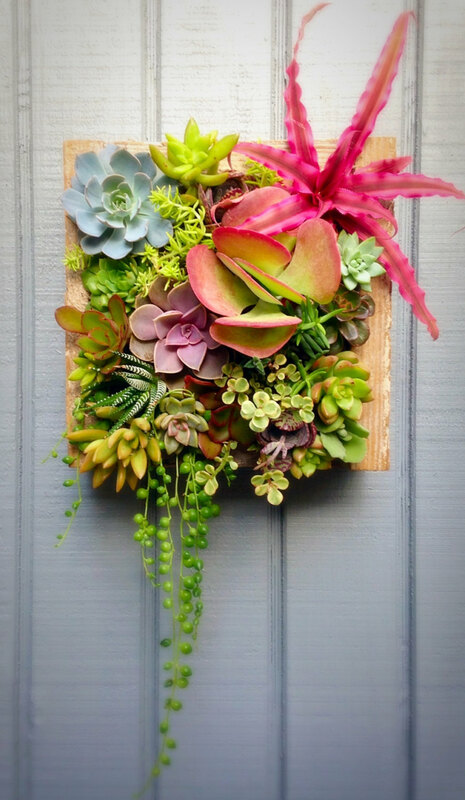 Elaborating on the ongoing and exploding vertical garden wall phenomenon, let’s have a look at this exquisitely designed succulent garden wall decor. A living piece of botanical art, this wooden main frame has been painted with matching colors to the wide selection of plants and colors appropriate to a vertical garden arrangement. In particular, Dudleyas and Sedums are especially simple to grow from plant cuttings and are even easier to maintain. An old garden watering can, or large canister filled with overflowing succulent flowers, makes one interesting piece in your garden. If your garden’s theme is rustic in nature, this display goes perfectly on an old table or wooden bench. 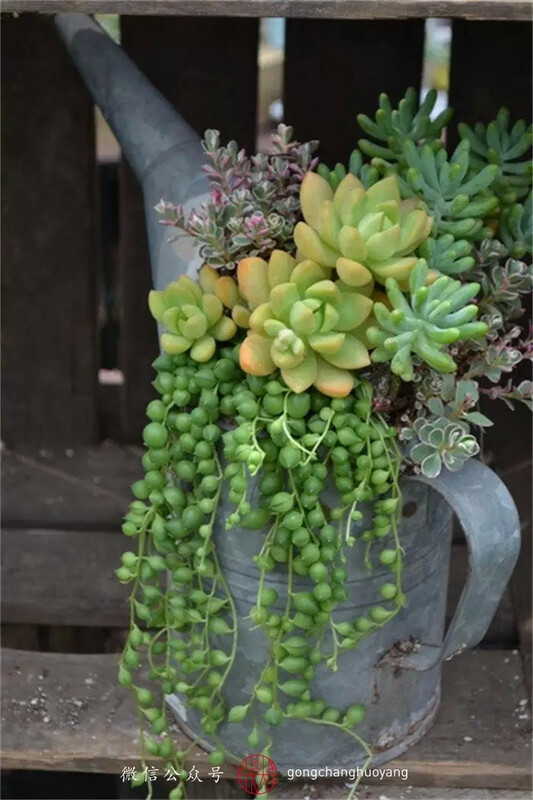 Generous strands of “Silver Falls” Dichondra or another hanging species of the succulent family gives the visual effect of water that flows over from inside the canister or garden can. Naturally, you may opt to leave the canister or garden can just as it is, or you may decide to paint it before planting with brightly colored designs. Especially attractive in a seashore setting, this small and easy to make design is just what you need to accent the mood of the ocean. Adding a few seashells can only make land lovers yearn for the ocean waters when they see this design in your garden setting. A wooden square piece hung on a wall much as you normally would hang a picture frame is all you need for a backdrop. A good assortment of plants embedded into a moss foundation that’s been glued on the wooden board is all you really need to complete this unique and charming display. Particularly suited for a medium-sized space in a backyard, this arrangement is great for having several paths leading to glass containers. Although this particular scene has only three glass decanters, more can be easily added to make a perfect “sea of glass.” Large-sized rounded river stones form one backdrop, and larger sized coral rocks form other backdrops leading to your glass-accented decor. What plants to insert? Well, basically anything in the cactus or succulent family will do. Blue glass jars and blue colored stones enhance the look of a glassy sea.